St. Lucia, SLU Vacation Rentals: Villas/Apartments & more. Hundreds of Unbiased Guest Reviews With Photos. Featuring The Top Places To Stay In Soufriere Short Term. AN ENTIRE ISLAND TO PLAY WITH. Forget hotels and crowded resorts, if you are looking for St. Lucia vacation rentals, airbnb villas in Soufriere are a far superior option. Staying in luxurious Serrana Villa or Sargas Villa is how the vacation of a lifetime begins. Looking for something a little smaller that still offers that home away from home experience? Sapphire Apartments is definitely the way to go. Forget sharing all of your amenities with others- a Soufriere vacation rental lets your getaway allow you to actually get away! ​If the ultimate in style and comfort sounds like paradise to you, our luxury St. Lucia villa rentals are second to none. 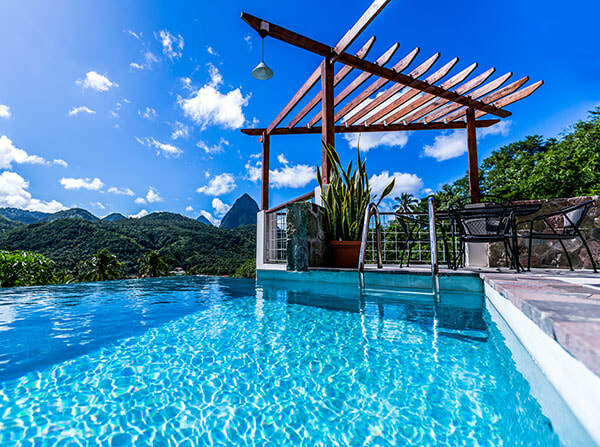 With breathtaking views and amenities ranging from infinity pools to modern appliances and the most relaxing showers on earth, these St. Lucia rental villas leave no stone unturned when it comes to exceeding your every expectation. ​If you are looking for a more budget friendly rentals in St. Lucia, don’t settle for a boring hotel. Sapphire Apartments offer a real home away from home with ample amenities, access to information and discounts on many island attractions, and an attention to detail and comfort that you won’t find anywhere else. ​It is well known that word of mouth is the most important and effective form of advertisement, and the Islander Villa Escapes team is proud to let our properties speak for themselves. Unsure whether our villas are really as majestic as our descriptions and photos imply? ​Don’t just listen to us- listen to what our former guests have to say. We offer more than just the best vacation rentals in Saint Lucia- we offer a home and an experience that will stay with you for the rest of your life. While many travelers come to St Lucia for family vacations, it is also a paradise for romance. You will find that our Saint Lucia villas are minutes from St. Lucia Airports and perfectly suited for couples and that they offer the privacy and amenities needed to make your trip as romantic as you envisioned it would be. ​When you are booking your trip to St. Lucia, you likely want to plan ahead as much as possible. You’ve booked your flight, rented a property that will be more like home than hotel, and even created an itinerary of things you want to see and do- but what about dining? With our for-hire chef service, we bring the very best in local cuisine to you. 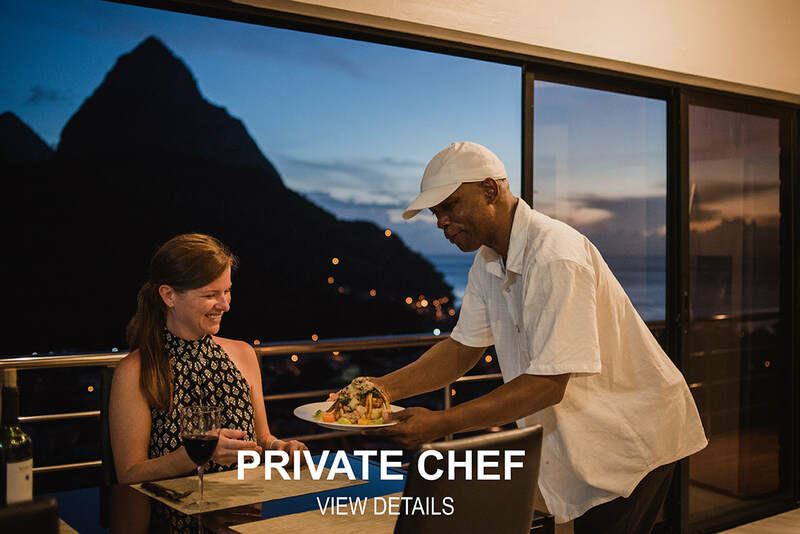 A private chef will come to your St. Lucia holiday rental and create a meal designed to delight even the pickiest palate. Best of all, there’s no need to leave your rental and even cleanup is included in the price! ​The best way to experience any new country is to get in touch with the locals, and our St. Lucia rentals make that easier than ever. Not only do we make sure that you live like a local, but our owner and staff members are happy to offer information on everything that the island has to offer. ​Whether you want to learn about the local favorite volcanic mud baths, to shop our markets, or to explore the island’s history, the Islander Villas team will help you make your St. Lucia experience as authentic as possible. St. Lucia Airbnb vs Hotels - Which Is a Better Deal? Find Out!! Excitement abounds in St. Lucia no matter what your speed. 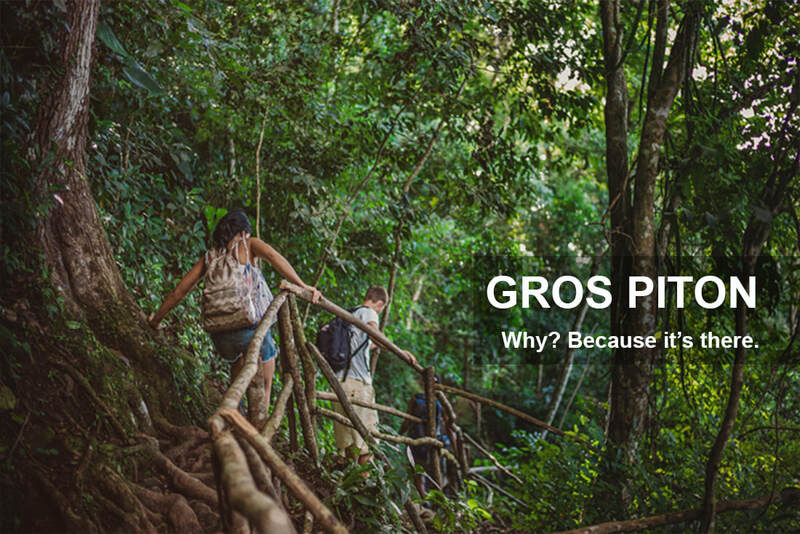 If you have a thirst for adventure, you can zipline through the rain forest or hike Gros Piton, while others enjoy a dip in the Sulphur Springs medicinal mud baths or exploring our waterfalls. Our wonderful island holds magic and excitement for anyone and everyone, and our St. Lucia apartments and villas put it all right outside your doorstep. When it comes to creating the perfect St. Lucia villa rentals, leaving no stone unturned is something we take seriously. Islander Villa Escapes can connect you with the very best services that the island has to offer. While our Saint Lucia rental properties offer everything from appliances to internet and more, we also offer access to everything you need to make your vacation perfect once you go outside. ​From a 24/7 on-call chauffeur service to airport transfers, volcano tours, night parties, and vehicle rentals, just let one of our team members know what you need to make your trip perfect and stand back in amazement as we deliver. ​Looking to have an immersive experience? Look to these Trailblazers. ​Renting a hotel room is a very mundane experience. Hand over some money, get a key, and have a place to sleep at night. At Islander Villa Escapes, we know that you deserve so much more. Our St. Lucia vacation villas and apartments are designed to make sure that you always feel at home. From privacy to a bevy of amenities you won’t find anywhere else, we work very hard to make sure that you leave our island loving it as much as we do. We pay as much attention to our St. Lucia property guests as we do to the properties themselves. If there is anything our team can do to take your vacation from ordinary to extraordinary, all you have to do is ask and we will do all we can to make it a reality. If you are looking for the ideal way to spend your holiday, private rental properties offer the perfect option. Our villas are designed for comfort and relaxation, and they are spacious enough for everyone to have a place to unwind after a day of adventure or exploration. You will find that our villas are privately owned and immaculately maintained, and our experts will go above and beyond to ensure that your villa offers everything you need to let go of your stresses and truly enjoy your stay. Our St. Lucia Home Rentals are designed to ensure your maximum comfort. This means that you have access to air conditioning that will keep the heat away. Our villas also offer private pools so that you can take a refreshing dip. Of course, there's nothing quite like sitting in a nice, cool villa while looking out over the Piton Mountains during your morning cup of coffee. If you are looking for St Lucia apartment rentals that will keep you comfortable, you will find that we provide exactly what you are looking for. If you are simply looking for the best vacation rentals in St Lucia, let Villa Escapes be everything you need, want, and desire. You will find that we pay personalized attention not only to each of our villas, but to each of our guests. Let us know what it would take to make your visit to St Lucia perfect, and we will do our best to make it happen! ​Got Questions? Call one of our team members today to learn more about our Saint Lucia rentals before you even make your reservation. You can call us anytime at 758-486-1561 or email us at info@islelander.com. A friendly and knowledgeable professional will respond as quickly as possible. We want your St. Lucia vacation rental to be everything you dream of and more, which is why all of our properties were designed by our owner. Innovative in a way that is both simple and complex, you can see our love for our guests in every single detail of both our properties and our guest interactions. Still unsure? Contact us today or read what some of our former guests have to say!